Whenever a computer running Windows suddenly reboots without displaying any notice or blue or black screen of death, the first thing that is often thought about is a hardware failure. In reality, most crashes are caused by malfunctioning device drivers and kernel modules. In case of a kernel error, most computers running Windows do not show a blue or black screen unless they are configured to do so. Instead these systems suddenly reboot without any notice. 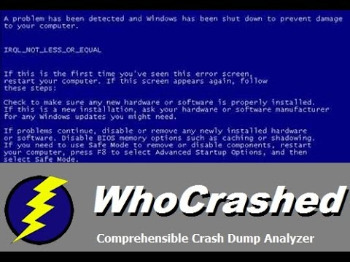 WhoCrashed shows the drivers that have been crashing your computer with a single click. In most cases it can pinpoint the offending drivers that have been causing misery on your computer system in the past. It does post-mortem crashdump analysis and presents all gathered information in a comprehensible way. If your computer crashes during system startup it is suggested that you boot into safe mode and then run WhoCrashed.